Cape Elizabeth Land Trust » 2018 Community Survey Results are in! 2018 Community Survey Results are in! Over the summer, we created and distributed a survey to organizations and residents in Cape Elizabeth. 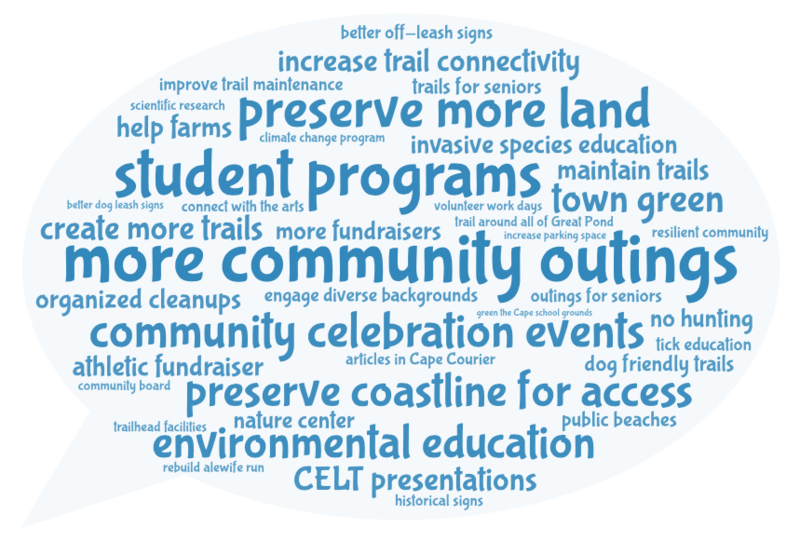 The goal of the survey was to learn what Cape residents cherish most about their town, and to determine what more the Land Trust can do in collaboration with Cape community members. We were thrilled to receive over 200 responses, and want to thank all of those who participated. So, what do residents cherish most? About 70% of the responses cited a natural element in Cape, including but not limited to, the coastline, beaches, woods and forests, and wildlife habitats. Other reasons people cherish Cape Elizabeth include open spaces, the natural beauty and the welcoming neighbors. It is great to learn that the residents in Cape place a high value on its natural spaces. Our other goal was to learn ways CELT can collaborate more with Cape community members in the future. We received a wide assortment of responses, and recurring themes included a desire for more community programming, more educational programs, an increase of stewardship efforts involving community volunteers and, of course, more land preservation. We will be using this feedback to help guide future choices we make at the Land Trust. Access the 2018 Community Survey Summary today!